From the Cottage Padina we go to P, to the Hotel Cave. 10-15 min from the cottage, on the left, after the river, we will see an indicator of wood with the words "the Reserve of the Valley of Ditches". Leaving the path, main, follow trailul that rises diagonally sloping edges, we pass only through rari?te and through several small streams, through which we enter the forest, rising on the site of the final edge quickly. Here we deviate after a short run, to the left, along the punched borders on vertical walls, and after we use the curtain neo, go in the building of the Towers, where we distinguish in the following order: in front, pyramids, Towers Seciului; on the plan of the next and to the left, Turnule?ul, and the right, forming a background shape, flat ceiling of both towers, Walls, Old, wrinkled cracks and chimneys cut into small intervals numerous surplombe. For easy identification of routes to add that the tower's broken wall through the passage podit with a box of rocks and debris called,Gangul Wall the old Lady", and towers between them, after forcing her to surrender Towers. The Route through the Old Walls Gangul. Climb up on the right, under the wall, while the basis of the split of the slope, where we see, on the face of the Tower Seciului (on the left, like us) the threshold stone, which marks the entry to the Trail Front. Passing further through the gap above the slope, go in Gangul Wall Old. In BCC. 6-8 m in the right is easy to distinguish the vertical flue, which represent the benchmark, and the first obstacle on the Track Neme? in the Wall, Old girl. In the distance, saying, left, right in the aisle, covered with vegetation, high steps, which form the Edge of the North Tower Seciului (Route Comanescu). Here we descend along one of the sides of the rocky approx. 10 km left to the left to force her to capitulate Towers and go out in the face of great pyramid Turnule?ului. This is the point where we discern the right, in the Wall Batrâna, the threshold is rocky, rising in some surplombe yellowish-reddish. This marks the entry on the track Fisurii falcons. B. route based on the Towers. Above flights at the fork, follow the left hata?ul that penetrate the base of the Tower Seciului, and further, to ensure that Turnule?ului, to discern after a distance of approx. 15 m to the right and 20 m above our engine with color stone ruginie which extended down the axis marks the entrance to the Central Route from the Tower Seciului. Here trailul, which begins to lead down after approx. 15 m at the point where we can see the top and our right, to force her to capitulate Towers. 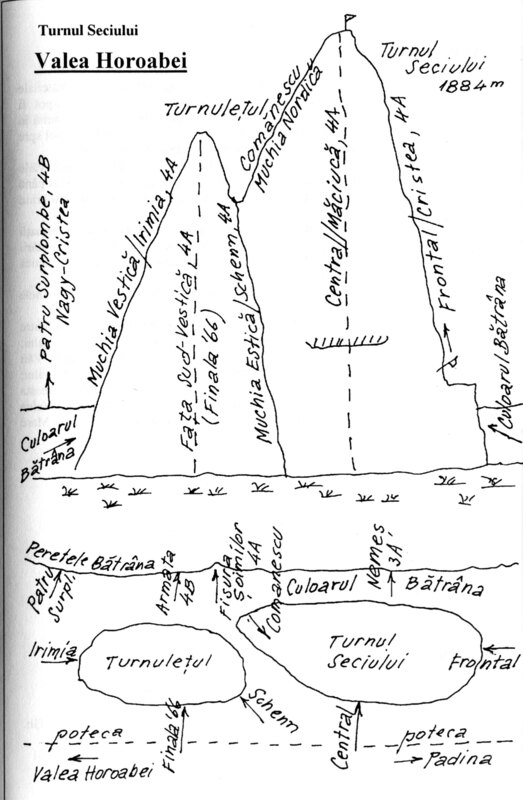 This is the place from which, half-right, found in the Wall Turnule?ului small belt that ascends diagonally and which marks the entrance to the Route of the Eastern Edge Turnule?ului. Going down under the wall, along the passage covered with debris, we arrive after 10 m near going wall, a cliff a few metres above us, overhang well visible where begins the ascent to the Face of the South-West to Turnule?ului. Finally, passing under the walls Turnule?ul southwest to reach, after a hard easy approx. 25 m, the point of penetration on the route Turnule?ului Edge of the world, where, finally, take Gangul Wall Old. From this point descend under the Wall, we use it in the area with the debris, within one wall of a small height, we pass by two grotto from which tâ?nesc several small springs, and here, continuing its way under the wall and to the left, descend quickly to the Valley stream Horoaba, sea waterfall called "the Waterfall Burlacului".